Being in control of your responses during emotional situations is essential for flexible behaviour. Three main processes are thought to contribute to flexible emotional behaviour: a) low-level emotional response predispositions, such as the tendencies to avoid negative and approach positive situations (Chen & Bargh, 1999; Darwin, 1872), b) instrumental (or learned) responses in relation to the context, determined by the contingency between response and outcome (Guitart-Masip et al., 2014); and c) the arbitration between emotional predispositions and instrumental responses, also called emotional control (Roelofs et al., 2009; Volman et al., 2011; Lee et al., 2008). In a line of studies, I have used the approach-avoidance task to investigate the neural mechanisms underlying emotional control. If you are thinking of using this task, feel free to email me. Design of the approach-avoidance (AA-task). When viewing happy or angry faces, emotional response predispositions trigger corresponding approach or avoidance actions. These predispositions could be followed during the ondition. 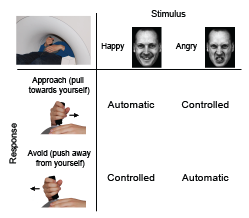 In contrast, when task instructions required participants to avoid happy or approach angry faces, emotional predispositions need to be controlled and override with the instructed response (controlled condition; Volman et al., 2011a). Image from Volman et al., 2013. The left column shows brain images indicating the localisation of significantly decreased (blue) and increased (red) regional cerebral blood flow (rCBF) after cTBS over the aPFC, during performance of the AA-task. The stimulation location is indicated by a white circle in A. Right column shows rCBF changes during performance of the AA-task (compared to control gender discrimination task) following cTBS over aPFC or control stimulations. cTBS over left aPFC induced bilateral rCBF reductions reductions in aPFC and posterior parietal cortex, whereas amygdala and FFA showed increased rCBF. Image from Volman et al., 2011a. Several psychopathological states are suggested to be characterized by profound imbalances in the ability to override social action tendencies. For example, patients with a social anxiety disorder (SAD) experience extreme fear of negative evaluations by others in social situations and show strong tendencies to avoid social situations (American Psychiatric Association, 1994; Clark & Wells, 1995). Even if their explicit long-term goal is set to approach a social situation (for example in therapeutic situations), they have large difficulties overriding their automatic avoidance tendencies. Patients with aggression-related disorders also have problems in controlling their emotional tendencies (Gray, 1981). Such disorders are often characterized by increased social approach behavior, leading to an increased chance of violent encounters (Von Borries et al., 2012). In collaboration with researchers from the Pompe clinic (Katinka von Borries, Erik Bulten, Robbert-Jan Verkes), I am able to study how the neural mechanisms underlying emotional control might be changed in criminal offenders with psychopathy. With collaborators from Overwaal 'Centrum voor Angststoornissen' (Rianne de Kleine, Esther Allart, Gert-Jan Hendriks, Agnes van Minnen), I investigate these mechanisms in patients with a Social Anxiety Disorder and patients with a Conversion Disorder. Finally, I collaborate with Sabine Herpertz and Katja Bertsch from the University of Heidelberg (Germany) who study these mechanisms in Borderline Disorder patients. The extreme and opposing action tendencies evident in social anxiety versus aggression seem to parallel extreme and opposing imbalances in hormonal systems thought to be important in the regulation of social motivational behavior. Whereas aggression is associated with high endogenous testosterone levels, social anxiety is associated with low testosterone levels (Gerra et al., 1996; Gerra et al., 1997; Giltay et al., 2012; Maner, Miller, Schmidt, & Eckel, 2008; Stalenheim, Eriksson, von Knorring, & Wide, 1998). Healthy participants with increased testosterone levels demonstrate reduced threat avoidance and altered control of aggressive behavior, characteristics that show a clear overlap with patients that have an aggression-related disorder (Archer, 2006; Glenn & Raine, 2009; Mehta & Beer, 2010; Van Honk et al., 1999; Von Borries et al., 2012). We showed that endogenous testosterone modulates the neural mechanisms underlying emotional control in 2 ways (see Figure on the left: Controlled - Automatic condition, image from Volman et al., 2011b). First, participants with lower testosterone levels generate larger aPFC responses during automatic trials compared to controlled trials. Second, during the same trials, endogenous testosterone modulates the effective connectivity between the aPFC and the amygdala. 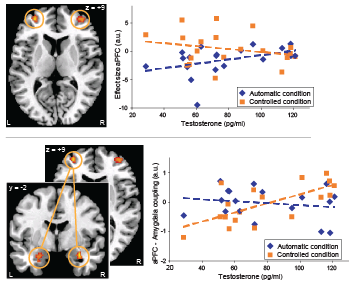 These results indicate that endogenous testosterone influences local prefrontal activity and inter-regional connectivity supporting the control of social emotional behavior. Click here for the paper. Specific genetic profiles can increase the vulnerability of an individual to develop SAD or an aggression-related disorder. A genetic variation of serotonin transporter availability (5-HTTLPR) predisposes for the development of social psychopathologies, such as anxiety-, depression- and aggression-related disorders, especially after a strong emotional event (Caspi, Hariri, Holmes, Uher, & Moffitt, 2010; Garcia, Aluja, Fibla, Cuevas, & Garcia, 2010; Karg, Burmeister, Shedden, & Sen, 2011). Alterations in the control of emotions could potentially underlie this increased vulnerability (Canli & Lesch, 2007). Studying the neural correlates underlying emotion control in this polymorphism has therefore also been suggested to be important to disentangle the precise mechanisms behind these gene-environment interactions (Canli & Lesch, 2007). Using advanced modeling of inter-regional connectivity (Dynamic Causal Modeling [DCM]), I showed that s-carriers of the serotonin transporter gene have an increased amygdala response when social emotional behavior needs to be controlled, and that this amygdala alteration originates from a reduced inhibitory regulation by the aPFC. The left panel of the image (from Volman et al., 2013) shows a summary of the winning DCM models. 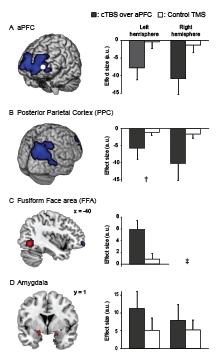 In short, face presentation drives fusiform face area (FFA) activity, which projects to the amygdala (AMY) that is bidirectionally connected with aPFC. Emotional control (EC) modulates the connection from AMY to aPFC and the negative feedback loop of aPFC. The right panel shows the strength of the aPFC to amygdala connection with an inhibitory effect from the aPFC to the amygdala, that is absent in s-carriers. More detailed information can be found in the paper [link]. Together the findings present a mechanism explaining the increased vulnerability of s-carriers to develop psychopathologies. Furthermore, they suggest that increasing the capability to exert emotional control might be an effective (preventive) strategy for s-carriers in case they need to be prepared for challenging situations, for example in stressful professions. Anna Tyborowska is working as a PhD, supervised by Karin Roelofs, Ivan Toni and myself, on this project looking into the neural mechanisms underlying emotional control in 14 and 17 year olds. This longitudinal developmental project is part of the Nijmegen Longitudinal Study on Infant and Child Development (NLS), which has followed children and their families since infancy. In collaboration with Sven Bestmann I aim to disentangle the different influences of emotional biases, instrumental responses and arbitration of these processes (emotional control) on emotional behaviour. Traditionally, emotions are thought to guide our behaviour either through fast instincts or deliberately selected actions. Current explanations of emotional health and disease frequently focus on one of these single components in isolation (or regard them as exclusive antagonists) and neglect putative interactions. For example, aggressive behaviour is commonly viewed as loss of emotional control or of strong emotional biases. These characterisations likely underestimate our emotional behaviour’s complexity and diversity. I will investigate a complementary account: I suggest that in humans optimal emotional behaviour arises not from these instinctual and deliberate action selection systems individually, but from their collective contribution and if needed their arbitration.